Sen. Cory Booker is making headlines for his "extremist" eating habits. A New York Post article on Sunday called the former Newark mayor an animal rights extremist after he announced on Twitter that he'd become vegan and supported a few pieces of pro-animal legislation. "New Jerseyans surely have more important work for him to do," the Post said, calling his work "irrelevant." One Green Planet countered that idea, though, by pointing out that Booker's anti-gestation crate bill was backed by 93 percent of New Jersey voters. 1. In November, he announced on Twitter that he was going vegan after being a vegetarian for 22 years. 2. He did a Daily Beast interview with animal-welfare activist Vlad Chituc where he promoted veganism as a healthy lifestyle: "I want to try to live my own values as consciously and purposefully as I can," Booker told the Daily Beast. "Being vegan for me is a cleaner way of not participating in practices that don't align with my values." I've decided to try being a vegan - at least until end of year. MT @shannonstewart8 Aren't you a vegetarian? 3. He posted an adorable video of a rescued turkey taking a bath and getting blow-dried. He co-sponsored the Prevent All Soring Tactics Act to strengthen existing laws against soring show horses. Soring uses painful substances to encourage an unnatural, high-stepping gait. He co-sponsored the Safeguard American Food Exports Act to ban horse slaughter and export overseas for food. He opposed the Sportsmen's Act. The act would have lowered protections for federal lands and wilderness areas, encouraged hunting of threatened polar bears and blocked checks on toxic lead ammunition, which can hurt animals and the environment. 5. He personally rescued three dogs: one from the freezing cold, another that was restrained in a crate for four days and one starving pit bull named Patrick. 6. Booker wanted to build a "state-of-the-art," no-kill shelter in Newark for his birthday and "to one day be able to save every savable dog and cat in this new shelter," he said in a column he wrote for the Huffington Post. 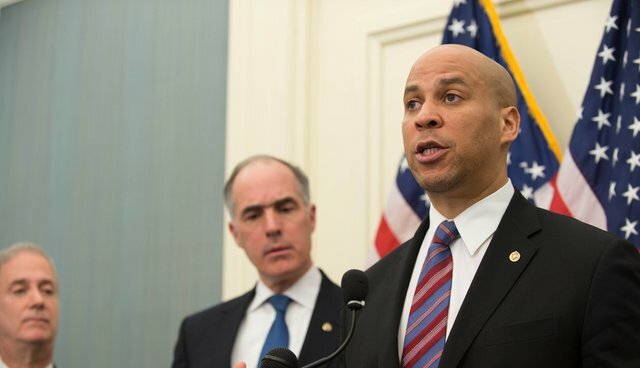 Erica Meier, the executive director of Compassion Over Killing, who attended Booker's swearing-in ceremony Tuesday, said the senator's outlook is inspirational, not extremist. "It's not extreme to care about your health, and it's not extreme to care about animals," Meier told The Dodo. "When I think about what's extreme, I think about the cruelty being uncovered in factory farms - that, to me, seems extreme." While waiting to meet Booker, Meier said she met a number of people who were going vegan because Booker inspired them. "He's really inspiring people to want to make changes that are improving their health - as well as helping animals and helping the environment," she said. CORRECTION: A previous version of this article stated that Cory Booker would like to build a no-kill shelter and "save every salvageable dog and cat in this new shelter." In fact, Booker said he would like to "save every savable dog and cat in this new shelter."